This morning, the New York City Department of Health shut down a Greenwich Village Taco Bell after concerned citizens videotaped dozens of rats frolicking in the restaurant after it had closed for the night. 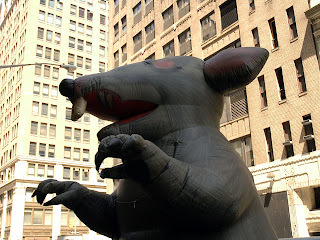 In Manhattan, it's pretty hard to avoid rats. Anyone with a sharp eye could easily spot a few every day--scampering along the city's gutters and subway tracks. But I must admit that the video is truly shocking, even to a jaded New Yorker like myself. And since we're on the subject of rats, I highly recommend the book Rats: Observations on the History and Habitat of New York's Most Unwanted Residents by Robert Sullivan. It's highly entertaining and a must-read for anyone who wants to understand one of mankind's greatest enemies. Wow thats a lot of rats. The Tacobell here recently closed too (it might have reopened) but i think it was because of some thing bad in the food or something. that is so incredibly, and unbelievably disgusting thing i've ever seen. oooooooooooooooooo yuck!!!! i hate rats! my brother heard about that 2 but he said someone found a dead rat in their sandwich!!! !